Blog – Page 2 – S.P.A.R.T.A. Congratulations! You’ve grown enough to hire employees in your personal training business. Now you need to train them properly and communicate your business culture, policies, and expectations to them. 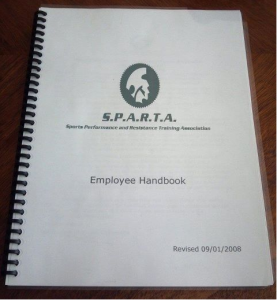 You need an employee handbook for your personal training business. But, you don’t want to sit down and write another book do you? Save yourself loads of time and energy. Simply purchase ours! A good general employee handbook that can be customized to fit the needs of any personal training business. Plus, bonuses employee acknowledgment form and exit interview included. Everything you could possibly need to convey your vision of how you want to run your business to your employees. Just simply customize the information to your business. This is an electronic downloadable copy you can adapt and print off for your employees. Click here to download immediately.